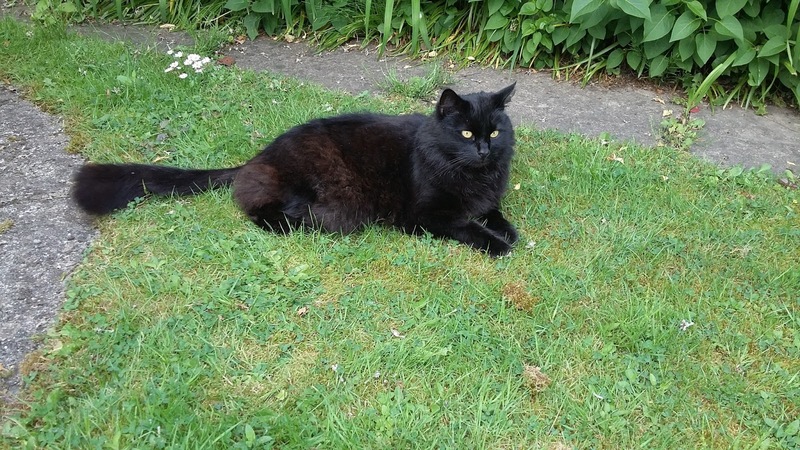 Our June pet of the month is the lovely Tigger who unfortunately got hit by a car about six weeks ago. During a busy Friday evening we received a phone call from a lady who’d seen a cat get hit by a car. She’d managed to pick the cat up and came straight down to the surgery. Our nurses carried out an initial assessment. He was breathing rapidly and was very sore around his back end.Student nurse Avril checked him for a micro-chip and we were delighted when the scanner detected one. We found out his name was Tigger and we were able to get in touch with his owners. Vet Joanna examined Tigger and concluded that he would need some x-rays taken as he was unable to stand on his hind legs. He would also need an x-ray of his chest and abdomen to check for internal injuries. Tigger’s condition was stable and with some pain relief he had a comfortable night. The following day vet Karolina sedated Tigger in order to take the x-rays. His chest x-ray was clear and importantly she could see that his bladder was intact. Looking at the bones of his pelvis and hips, Karolina detected a pelvis fracture and a partial dislocation to the sacroiliac joint; this is where the pelvis attaches to the lower part of the spine (sacrum). Treatment for this type of injury depends on a number of factors. In Tigger's case we opted to treat him conservatively with confinement and rest. The pelvic bones are completely surrounded by large muscle masses which act as a natural splint to help keep the bones in place.The first most important step was to ensure that the nerves that run through the pelvis had not been damaged so that Tigger could still pass urine and faeces. 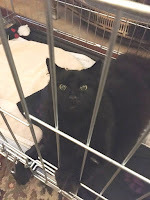 Tigger was a very worried boy when in the hospital so we sent him home with strict cage rest, with his owner's monitoring his toileting. We were pleased to hear that he'd managed to pass urine at home. Tigger came back in for a check up two days later and had been much happier out of the clinic, but he still required regular careful monitoring as he was having a bit of trouble passing motions and he was still not using his left leg. The vet was suspicious that Tigger's sciatic nerve might be damaged, but after discussing Tigger's injuries with a specialist orthopaedic surgeon it was decided to give Tigger more time rather than consider surgery. Often these types of injuries will improve on their own with just supportive treatment. After 6 weeks of rest and TLC, Tigger is on the mend and doing really well, albeit still a little wobbly!